This essay was published in the catalogue accompanying the Cosmos Calling! exhibition at Zacheta, Warsaw, summer 2014. In 1973 Krzysztof Zanussi made a movie, ‘Iluminacja’(Illumination), to explore the ways in which science, the state and religion understood life in its most immediate sense, that of the living human being. Relaying the fictional career of Franciszek Retman, a young physicist in the People’s Republic of Poland (PRL), over the course of the 1960s, Zanussi’s film is a brilliant collage of documentary material, interviews with living scientists and the venerable philosopher, Władysław Tartarkiewicz, as well as a narrative about the life of Retman and his young family. This arcs from a position of certainty in 1961 when, newly matriculated, Retman announces his desire to commit to physics because of its ‘concrete knowledge’, to one of existential anxiety after the failure to cure his unnamed malady, a life-threatening condition which seems to be triggered by his high ambitions. Zanussi’s film is a lofty philosophical enquiry, but it also has political overtones too. When, for instance, Retman is forced to give up his studies to meet the costs of raising his young family, he takes employment testing the cathode ray tubes in a factory making televisions: high expertise is put to the mundane needs of society. Another way of making a living includes volunteering for scientific tests. Retman is paid to sleep whilst wired to an electroencephalograph recording his brain activity in angular lines on a plotter. His dreams appear to have greater value than his thoughts. At the same time, various professional voices in the film hypothesize about the new frontiers of genetics, molecular biology and neuroscience. Here, the human brain is presented as new challenge to the technical and ethical limits of science. In fact, one section uses footage of open-brain surgery during which the neurosurgeon manipulates the brain of patient lying alert on the operating table. Pressure applied with a probe on the glomerulus region triggers the strong impression of smell in the patient. Smell, it seems, is not a phenomenon in the world but a product of electrical impulses in the brain. The passing of time in our minds can be equated to moving lighting. The present and the past, which exist in our memories, are illuminated, while the future drowns in darkness. Perhaps a method will exist to light up the future, to widen the scope of this illumination. Or maybe there are those who can find the vague outlines of that which will be tomorrow, even in the darkness. Coming from a physicist, such attitudes might sound astounding but modern science does not exclude the fact that the future exists in the present in ways that are similar to how our pasts exist in our memories. We observe the astonishing speed with which the new mythologies displace the old ones. In the intellectual life of a society in which the mechanism of tradition faith has become corroded, new myths proliferate with the greatest ease, even though they may originate in technical advances or scientific discoveries. Thousands of people fondly imagine that the friendly inhabitants of other planets will one day solve the problems from which humans cannot extricate themselves. For others the words ‘cybernetics’ embodies the hope of resolving all social conflicts. For Kołakowski the task of socialism was to improve the intellectual and environmental conditions of the individual in the present moment. This was an existential response to the interminable exaltation of the working classes during the Stalin years – fanfares made whilst ordinary citizens of all classes lived in miserable conditions and often in fear. The challenge for communism was the rehabilitation of the human being (one which was nourished by the ‘discovery’ and publication of the early writings of Karl Marx which articulated his ‘dream of the whole man’). Exuberant scientism and doubting existentialism represented two poles of thought in the Thaw years (and after). What was the ‘ideal’ – or perhaps simply tolerable – relationship of the individual to technology in an age which heralded intelligent machines and the extension of the human body by means of genetics or even biological prostheses? This was an urgent question in a society which claimed both to defend the individual against exploitation and also to be advancing to the utopia of full communism. In what follows, I explore some of the ways in which artists, composers, writers, filmmakers and designers in Poland in the 1960s and early 1970s sought to answer it. The declaration of the STR was accompanied by the revival of science fiction in the Eastern Bloc. Largely prohibited during the Stalin years because the genre had been employed as a vehicle for expressing doubts about the possibility of utopia, it offered a vivid platform for imagining the future and, perhaps, forgetting the recent past.Ikarie XB-1’, a Czechoslovak movie (dir. Jindřich Polák, 1963) is typical of its kind. Set in the year 2163, the film is an adaptation of StanisławLem’s Obłok Magellana (The Clouds of Magellan, 1955)and describes the long journey of the Ikarie XB-1, a space craft, to a satellite of the star Alpha Centauri known as ‘The White Planet’. Representatives of the communist society of the future, the crew encounter the floating wreck of a spaceship launched from earth in 1987. Its crew is long dead but the ancient craft still carries its highly-toxic cargo of nuclear and biological weapons. In this way, ‘Ikarie XB-1’ passed comment on the Cold War antagonisms of the day and signaled mankind’s long term destiny. Much of the narrative of ‘Ikarie XB-1’ takes place on the spaceship’s flight deck, furnished with illuminated consoles and massive screens feeding images from the dark vacuum of outer space and pulsing abstract patterns. Life on board is overseen by the ‘Centrální Automat’, a computer with tremendous processing power which answers the crew’s questions in the machinic voice characteristic of the genre. Enveloped by this voice and enclosed by screens, the crew control the artificial environment and the flight of the ship through banks of switches, lights and monitors. Performing what they imagined to be the operating routines of the future, the actors ‘play’ the interfaces like musicians, rhythmically tapping out their instructions as if playing some kind of as yet unknown instrument. When the crew slip are rendered unconscious as an effect of a radiation cloud, the mission continues. The computer oversees an ‘unmanned shift’, before the crew revive twenty-four hours later. This image of human dependency on the intelligent machine marked a significant shift in the technological imaginary of the Eastern Bloc under Soviet rule. During the Stalin years, for instance, the emergent science of Cybernetics had been represented as an ideological weapon which would deprive mankind of its humanity – a zombie science originating in the West which would replace humans with docile machines. ‘The process of production realized without workers!’ screeched one Soviet critic with the pen name, ‘Materialist’. ‘Only with machines controlled by the gigantic brain of the computer! … what an enticing perspective for capitalism!’ Consequently, this adolescent science went underground with its early adepts camouflaging their interest with specialist jargon. In his 1955 novel on which ‘Ikarie XB-1’ had been based, Lem – for instance – substituted the term ‘mechanioristics’ (‘mechaneurystyki’) for cybernetics in an unsuccessful attempt to avoid censorship. In the changed conditions of the Thaw, Cybernetics was recast as a technocratic and progressive science. The Polish adepts of this new creed promised to apply its insights to the planned economy, to the classless society and to socialist culture.Visions of intelligent machines which might divest man-made systems of human error and of dynamic, self-correcting communication techniques based on feedback loops seemed like a panacea for the economic inefficiencies inherited from Stalinism. Modest versions of the computerized space deck on ‘Ikarie XB-1’ were found in the command and control centres that began to be constructed in Eastern Europe in the 1960s. Computers were introduced into Główny Urząd Statystyczny (Chief Statistical Office) in Warsaw and the Państwowa Komisja Planowania (State Planning Commission), key bureaucratic instruments in the management of the command economy in Poland. Coal mines and power stations were modernized by the introduction of operation rooms equipped with illuminated panels to oversee the distribution of material, energy and working bodies in real time. Technocratic spaces, these information centres were, nevertheless, objects of public knowledge. Typically, they appeared in news reports as depopulated zones. If workers were present, they were white-coated personnel dedicated to servicing these new thinking machines. In ‘Komputery’ (‘Computers’, 1967), a short educational film made by Zanussi before ‘Iluminacja’, for instance, the camera tracks smoothly through banks of computers and monitors. 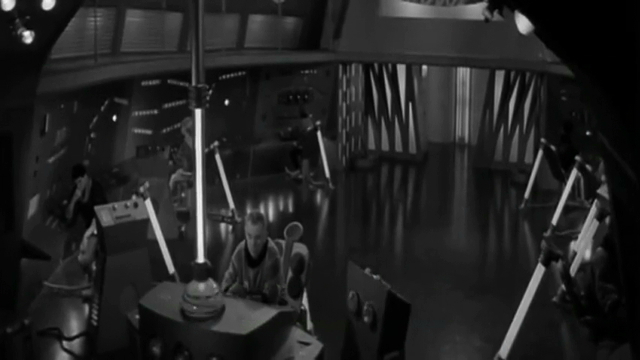 The soundtrack, pulsing lights and the voice-over make it clear that these intelligent machines are at work on important tasks like calculating ‘the optimal economic plan.’ In a volte face, the ideological prohibition expressed so vehemently in the mid 1950s against the replacement of workers by machines seemed to have been overturned, though as Lem, writing on cybernetics ten years later, noted, the modern mind was still ‘haunted by the medieval myth of the homunculus, an artificially created intelligent being’. And when Zanussi sets out to explain the switching mechanisms contained within the smooth cases of mainframe computers in his film, he choreographed children dressed in polka dots or stripes on a grid. Representing binary code, they symbolise innocence and, of course, the future: what better way to humanise the intelligent machine? Ergonomics was another state-sponsored science which gained importance during the 1960s. An international field, Ergonomics in the PRL took particular interest in the measurement of the body at work, supplying data which could improve the design of equipment and machinery in state factories. It provided ‘evidence’ of the claim that socialism could serve the needs of the worker better than capitalism and staked out a difference from the commercial practice of product styling. The Instytut Wzornictwo Przemysłowe (The Institute of Industrial Design) established its Zakład Badań Ergonomicznych (Department of Ergonomic Research) in Warsaw in 1964 to assess the design of machines and equipment. In the same year artist and designer Andrzej Pawłowski formed (with Zbigniew Chudzikiewicz) the Industrial Design Department at the Academy of Fine Arts in Kraków with a common purpose. Both drew on an extensive exercise in measuring Polish bodies which had been conducted between 1955 and 1959 by the Anthropometric Commission of the Polish Academy of Science (full data for 100,000 individuals). These largely static measurements were augmented in the course of the 1960s in numerous tests to test body movement – grip, stretch, rotation, reach, etc. – as well as human reaction and other effects of perception. By the early 1970s, the human instrument had been thoroughly mapped for the ‘needs of design’ and ‘the needs of the machine’. There are many precursors for this kind of design scientism: they include Frederick Winslow Taylor’s time and motion studies in American factories at the beginning of the twentieth century and the experiments of Alexei Gastev to improve worker efficiency in Soviet Russia in the 1920s. ‘Russian Taylorism in Gastev’s Institute: Investigations into the rational handling of firearms by means of chrono-cyclography’ (from René Fülöp-Miller, The Mind And Face Of Bolshevism, 1927). A poet whose writings hymned the machine before the October Revolution (‘the iron demon of the age with human soul, nerves like steel, muscles like rail’), Gastev imagined all aspects of life in the future as being regulated by self-regulating and self-correcting machines. Humanity would itself become machine-like, cleansed of irrational emotion – ‘no longer expressing himself through screams of pain or joyful laughter, but rather through a manometer or taxometer. Mass engineering will make man a social automation.’ To shape Soviet machine men and women, Gastev founded the Central Institute of Labour (Центральный институт труда) in 1920 which ran a network of training centres where workers were taught to think and act. Trainees were drilled to regulate their actions using tools at workbenches in order to conserve energy and maximize efficiency. One visitor to Soviet Russia wrote: ‘Anyone entering through the front door of this institute as a normal living man issues from the back door, after passing through countless laboratories, as a completely perfected working machine.’ Curiously, Gastev was attacked for not being ambitious enough: ‘ .. the mass man is to be part of a mighty aggregate of turbines, and not transformed into a might cobbler’s awl.’ In other words, in concentrating on the actions of the hand equipped with manual tools, Gastev’s programme did not live up to Lenin’s industrial ambitions. Nevertheless, the scale of the Central Institute of Labour’s programme was truly industrial: half million workers and 20,000 instructors were trained between 1921 and 1928. Unlike Gastev, who sought to organize the body for maximum efficiency at the bench, ergonomic design in the PRL fifty years later claimed to reduce psychological and physical injury in the factory. ‘Through creativity in the industrial field,’ wrote Pawłowski in 1965, ‘we come to understand the most rational conditions for the protection of the biological and psychological existence of the human being, as well as the development of culture in industrial civilizations, the dynamics of which have become the cause of a dangerous loss of balance between civilization and the culture of its exploitation.’ Pawłowski claimed naturalizing and humanizing effects for his work in industrial design. In his designs, Marx’s ‘dream of the whole man’ still resonated. Nevertheless, the visual data generated by ergonomic research formed a striking and often bizarre genre of images in the PRL. [ill 8] In tests, machines were reduced to their interfaces – buttons, pedals, levers and switches; workers were turned into gestures or functions; and factories and workshops were replaced by white-walled laboratories. Entirely absent were the products and services provided by these machines or their place in the networks of power or industry. Machines never failed in this new imaginary; and workers did not slack. In the most advanced expression of this science, the operations of driver of a crane or the use of a lathe could be rendered as algebraic formulae. As publicity for socialist science, ergonomics was a fetishistic, technocratic knowledge, providing the authorities with an image of ‘clean’ industry populated with willing workers (something that could not be guaranteed in life). 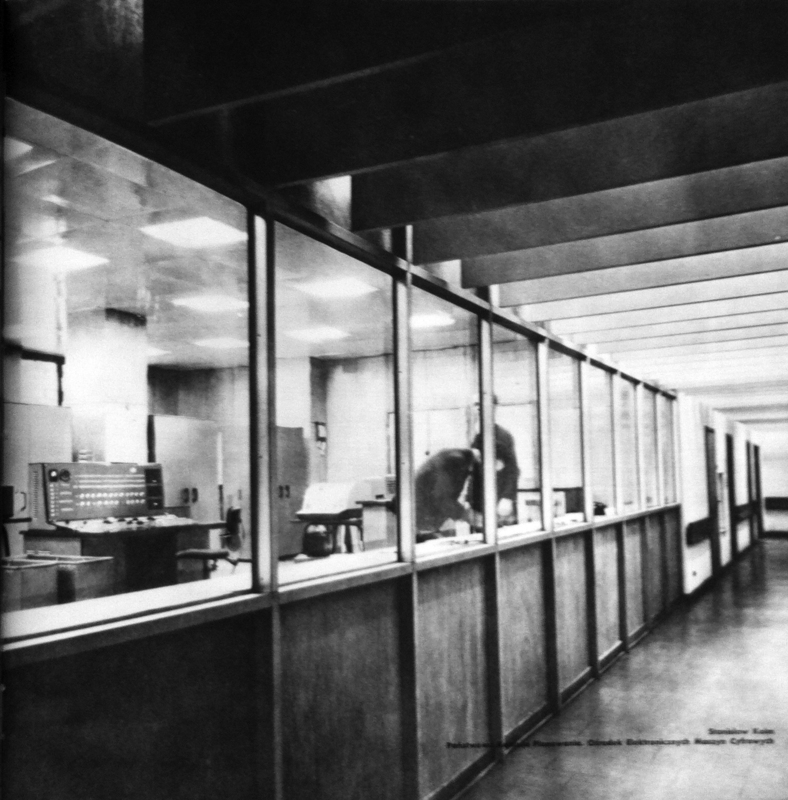 By replacing the mammoth engineering works populated with sweating workers and coal-fired furnaces – the drive shafts of communist industry in the Stalin years – for the laboratory-like conditions of the command and control centre or the ergonomically-designed workstation, a symbolic decontamination of the past was also being undertaken. The violence and irrationalism of the Stalin years – the gulags, the show trials, delusional claims about the Party’s infallibility – could be flushed clean with science. And disconnected from the output of industry, ergonomics itself came – like the computers in the State Planning Commission – to seem like a closed circuit, disconnected from the real conditions of life. In Zanussi’s 1973 film ‘Iluminacja’, the young scientist Retman asks ‘Where does a man stop being a man?’ He is troubled by the the interventions that medical science makes into the minds and bodies of patients that he witnesses whilst working in a hospital. When a doctor asserts that the body is just a set of ‘biological processes’ in which medical science can ‘interfere’, Retman responds by saying that the ‘spirit’ and body are indivisible. 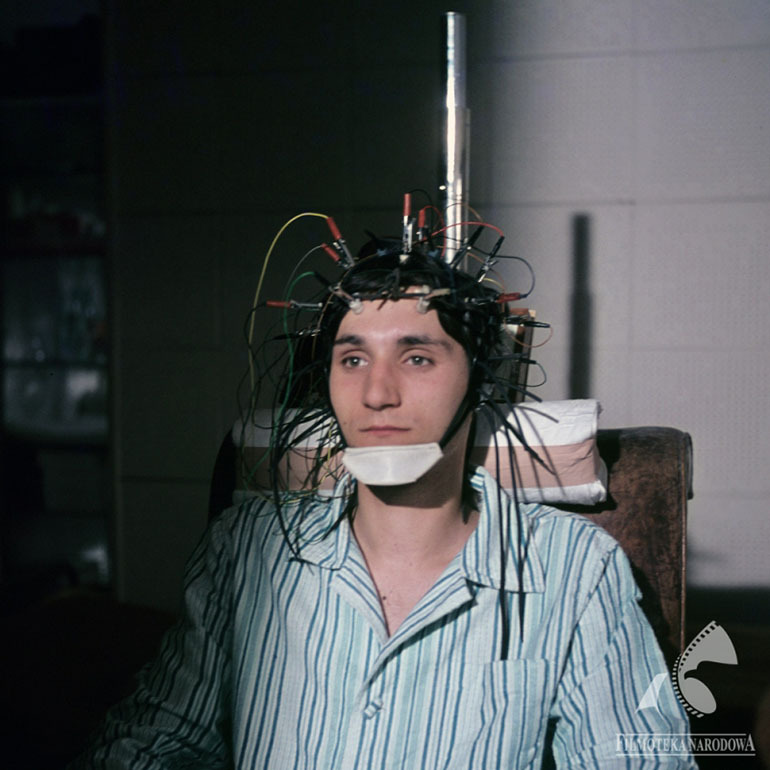 And this seems to be Zanussi’s view too: later in ‘Iluminacja’, medicine’s confidence in its capabilities comes to seem overstated when the death of a patient after brain surgery to cure his epilepsy is depicted. But Zanussi’s purpose is not to highlight the failures of medicine but to test its limits. Retman’s question had been asked just a few years earlier in ‘Przekładaniec’ (‘Layer cake’) a short film adapted from a short story by Stanisław Lem for television by film director Andrzej Wajda in 1968. Ostensibly, it is a light-hearted story of racing driver, Ryszard Fox, set in America in the near future. The downtown landscape is formed from sweeping concrete highways and glass curtain walled towers (with a newly competed point block in Warsaw’s ‘Ściana Wschodnia’ providing the hospital setting where much of the action takes place). Ryszard Fox receives his brother’s internal organs after his death in a crash on the racing circuit. So complete is the extent of the transplant of organs that Tomasz Fox’s life insurance company rejects his widow’s claim. As one character remarks in the film ‘When is a person alive? When his or her vital organs are alive. The places where they are situated are not important.’ With 70% of Tomasz’s biological material ‘invested’ in his brother and in others, he is, the company’s lawyer claims, only ‘30% dead’. The cyborg has a number of biological elements, such as the skeleton, the muscles, the skin, and the brain, but this brain consciously regulates what used to be involuntary body functions. In the key points of its organism, there are osmotic pumps, which, in case of need, inject nutritious or active agents – medication hormones impulse-inducing substances – or agents that lower basic metabolism, or even agents that induce hibernation. … The cyborg is not a partly prosthesized human; it is a human that has been reconstructed in part and equipped with an artificial system of nutritional regulation- which facilitates [its] adaptation to various cosmic environments. For Lem the cyborg was simply a stage in an accelerated process of evolution now that humankind had the means to alter its own biology. Moreover it demonstrated that the ‘current model’ of the human being – itself an adaptation to life on Earth – was no more universal or natural than the cyborg of the future. I do not trust any promise. I do not believe in assurances based on the so called humanism. The only way to deal with a certain technology is another technology. Today, man knows more about his dangerous inclinations than he knew a hundred years ago, and in another hundred years his knowledge will be even more complete. Far from rejecting the STR and other forms of scientism, Lem accused them of lacking daring. After watching ‘Przekładaniec’ on television in August 1969, Lem wrote to Wajda congratulating the director on his adaptation. He also noted the imaginative and ingenious ways in which the film’s designers (including Barbara Hoff, the celebrated fashion designer) had created the scenography and costumes: ‘The imminent, indefinite “future” has been very cleverly constructed, especially considering the scant means you had at your disposal.’ Poland in the late 1960s was – in material terms – poorly-equipped to embark on the creation of the brave new worlds of science fiction or the post-human forms of life projected in Summa Technologiae (a point made forcefully by Leszek Kołakowski in his critical review of the book. Nevertheless, the STR had licensed a culture and infrastructure in which ‘experiments’ could be conducted not only by cyberneticists, psychologists and ergonomic designers but also by artists, film-makers, architects and musicians too. Galleries, theatres, film and recording studios were described in the 1960s – by their creators – as ‘laboratories’ and artworks as ‘instruments’. Belonging to the newly-licensed zone of ‘experimentation’ and sharing the official rhetoric of progress, these labs enjoyed resources and relative freedom from censorship. 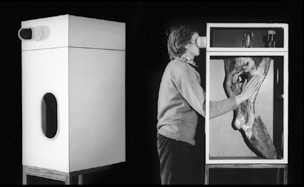 In these settings, artists used technology to extract and separate the functions of the body.Human faculties – like touch and sight – could, it seems, become object-like with the aid of technology. Composer Krzysztof Penderecki created, for instance, ‘Psalmus’, his major work of electronic music in the Experimental Studio of Polish Radio in 1961. Established three years earlier, the studio’s founder, Józef Patkowski, had imagined it as a kind of laboratory where a composer, working closely with a skilled engineer, could manipulate sounds materially (by editing and joining tape) and electronically (using filters and generators). Judgments could be made about the timbre, dynamics and pitch of any sound with little or no need to involve musicians. Working with recordings of basic elements of speech – vowels and consonants – Penderecki and engineer, Eugeniusz Rudnicki, filtered and processed the sound of two human voices, a soprano and a baritone. These treatments produced long notes which shifted in pitch and colour as well as percussive sounds and tremolo effects. Listening today, the piece remains extraordinary: a ‘natural’ capacity, the human voice, is rendered ‘artificial’ and given the task of expressing sounds rather than singing words. Here was a new conception of what a human voice might be when detached from its sounding body. ‘Stymulatory wrażeń nieadekwatnych’ (Stimulators of Non-adequate Impressions, 1963-4). The author of an early experiment in an experimental recording studio, Penderecki was not alone in being galvanized by the prospect of capturing human faculties. 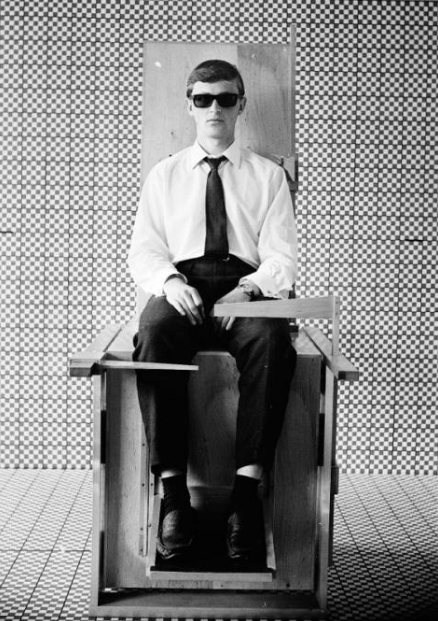 Andrzej Pawłowski, a prominent artist as well as an industrial designer (see above), isolated the human facility of touch in a set of experimental devices that he called ‘Stymulatory wrażeń nieadekwatnych’ (Stimulators of Non-adequate Impressions, 1963-4). [ill 10]Textured natural materials like roughly-cut timber and stone were placed in clinical white boxes. Users were encouraged to touch these things through narrow apertures with sleeves that made it impossible to see what was felt. Images and other objects were placed above in another box, which could only be penetrated with sight. According to Bożena Kowalska, this resulted in a ‘conflict between coherent sensations received by the sense of sight and touch.’ In dividing the senses, Pawłowski’s purpose was to better understand their interconnection in the human sensorium. in Warsaw. [ill 11]The small gallery was divided in two parts: in one, visitors encountered flashing spotlights and hanging mirrors, some spinning. The other space was occupied by the artist, isolated and invisible behind a screen formed by with plastic balls bristling with nails. Borowski, hidden, watched the reactions of the visitor. The audience was presented with itself in the mirrors, albeit in highly fragmented and temporary impressions. The eye was not allowed to focus or to rest. Borowski arranged the gallery as an experiment which both accentuated and denied vision, in this way drawing attention to sight itself. His preoccupation with visual perception was emphasized by the installation of a red illuminated sign with the command ‘Cisza’ (‘Silence’). MIRROR. The unreal image of the object achieving the right illusions. Replaces the object of art as a catalyst of sensations. Eliminates the ‘noise’ that always accompanies the information provided by the image. In the traditional image there is only ‘noise’ when trying to take in the range of information. Many of these experimental schemes conducted by artists in the first half of the 1960s employed technology to draw attention to the fragmentation of the self. In dividing and enhancing the senses, Pawłowski was, for instance, interested in how they might be better combined. But at the end of the decade more self-consciously critical approaches to the extension of the body by technology appeared in Polish art. In the aftermath of the events of 1968, the principal axioms the Thaw – that technology was innately progressive or that Soviet-style socialism could be reformed and humanized – came to seem naïve. Makarewicz’s ‘Cybernetic Steering System’ – discussed above – is one marker of a new, critical sensibility. Others include the early works of the artist Krzysztof Wodiczko, a recent graduate of the Warsaw Academy of Fine Art industrial design programme. Of his studies, Wodiczko said ‘I was trained to be a member of the elite unit of designers, skillful infiltrators who were supposed to transform existing state socialism into an intelligent, complex, and human design project.’ As if to fulfill this destiny, he had been employed as a designer for Unitra, the main state electronics conglomerate in Warsaw. This was not his only connection to the experimental zone of technology: the son of a prominent conductor, he was also connected to the Experimental Studio of Polish Radio. In fact, he turned to the Studio’s engineers for advice on the construction of a series of technological artworks that can be understood as musical instruments. The instrument allows the conversion of ambient sound. The instrument relies on the movement of the hand. The instrument responds to sunlight. The instrument is used in any place and at any time. The instrument is intended solely for the author. The instrument enables the author to achieve virtuosity. One year later Wodiczko prepared an instrument for the Experimental Studio of Polish Radio. In these projects, Wodiczko seemed—at least ostensibly—to extend human capacities. The Personal Instrument turned everyday activities like walking in the city into music and the Instrument–Percussion Laboratory was, as Wodiczko said explicitly, an open form. Yet the forms of these objects clearly confounded the neutral, technical explanations that Wodiczko gave his works. They are better understood as allegorical devices. The Personal Instrument, for instance, alluded to the practices and technologies of surveillance, a branch of applied electronics that was put to malign effects in the Eastern Bloc under communist rule. Moreover, Wodiczko’s instrument – which seemed to require the emphatic hand and arm movements of it wearer – produced the unsettling image of a man under the control of a machine. 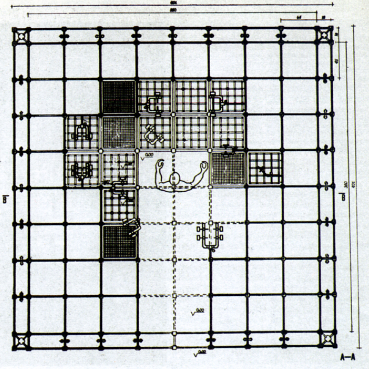 Similarly, the Instrument–Percussion Laboratory contained its user, dreaming of control over his or her environment, in a prison-like grid of geometry. The Workshop’s members were, as Kwiek recalls, ‘scientifically minded’, reading widely in psychology and cybernetics. Working with film, photography and, within a few years, video, they set out to explore the practices of the ‘operator’ rather than the artist. Many of the films created by the Workshop’s members have the procedural, though often improvised, character of a test: what will be the effect of this action in these conditions? 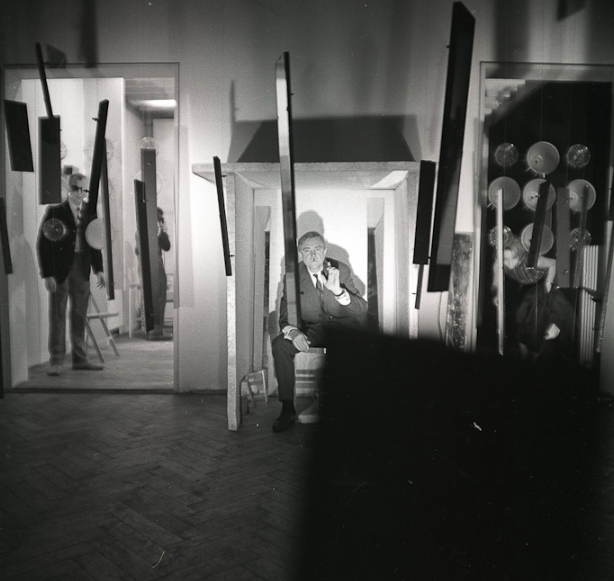 Objectivity was set as an ideal: ‘A documentary film’s aim is to provide the truth about man’, wrote Paweł Kwiek in 1974 for instance, ‘both for the sake of Art as well as from a scientific point of view. So far, however, it has not been possible to prevent the distortion of the truth, which results from (the subjectivity of the creator).’ Direct forms of image making like the camera could, he thought then, diminish such distortions: ‘We can conclude’, he continued, ‘that the truth we receive from man is based on direct contact with him, regardless of what he would like to show himself or in what fashion he would like to be perceived …’. One approach to direct forms of image making was to combine medium and body (resulting in what Robakowski called ‘biological-mechanical records’).In an early ‘test’ film, Prostokąt dynamiczny (Dynamic Rectangle, 1971), he recorded his attempts to match the insistent, mechanical rhythm of a piece of music created by Eugeniusz Rudnik in the Experimental studio of Polish Radio (Penderecki’s engineer when making ‘Psalmus’ ten years earlier). 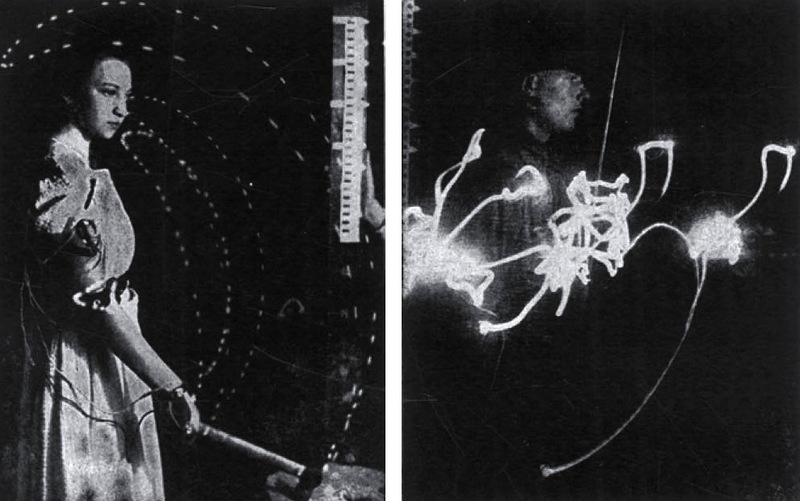 The on-screen image of a pulsing and mutating red rectangle was achieved by Robakowski opening and closing a diaphragm manually in front of the 35mm camera as he listened to the music. The piece is never quite in sync as the image (created by the live movements of the artist) fails to accurately match the sound (pre-recorded music). Knowing that behind the image there is a body falling short of the measure of the machine lends poignancy to Robakowski’s ‘test’. 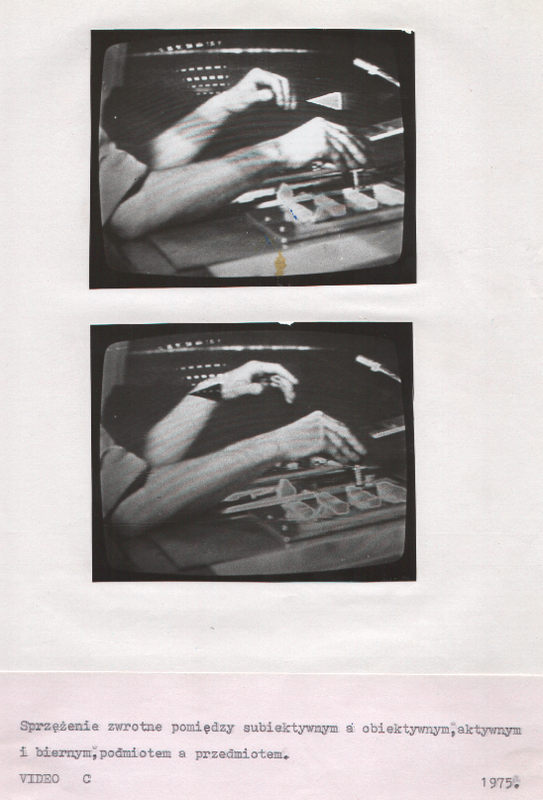 Similarly, ‘Video C’ (1975) by Paweł Kwiek, made when the members of the Workshop were given access to a television studio, records the hands of an operator (Kwiek himself) manipulating the faders and buttons of a vision mixer, a device used to switch between video sources in a TV studio or to add graphic effects to the picture. [ill 14]The operator appears to be using his fingers to move a triangular cursor around the TV screen. Sometimes it seems to hover, as if trying to touch the on-screen hand or to trace the line of the operator’s arm in space: sometimes the on-screen hand responds, appearing to palm the cursor back or to map its three points with a pinch of the fingers. Kwiek explained his interest in this impossible union thus ‘I construct such sets where the observed reality is the human being, for whom, in turn, the image of reality is his own constructed image.’ In this mise-en-abyme, what distinguished a human being from his or her electronic image dissolved. What is striking about the works produced by the members of the Workshop of Film Form (and Wodiczko’s instruments) is that many of their ‘experiments’ were conducted on themselves. In other words, they were self-experiments in which one was both a performer and an observer at the same time. In closed circuits such as this, self-portrayal becomes a form of self-observation. Numerous commentators have identified a degree of schizophrenia in arrangements created by artists like Bruce Nauman: ‘The medium of video art’, writes Rosalind Krauss, for instance, ‘is the psychological condition of the self split and doubled by the mirror reflection of synchronous feedback.’ In the case of the films made by Workshop of the Film Form, one might also detect a kind of pathetic quality: Robakowski’s body fails to fall in line with the rhythm of the machine; and Kwiek’s ‘Video C’ attempts an impossible act (one kind of immaterial pointer, a cursor, attempts to touch another, a human finger). Science and technology – the site of considerable hubris in the PRL in the 1960s and early 1970s – was used, it seems, to produce pathos. In their claims on objectivity and body-machine union, the works by the members of Workshop of the Film Form ought to be a kind of high water mark of scientism in the PRL. Moreover they were made at a time when a new regime under Secretary of the Polish United Worker’s Party Edward Gierek was announcing yet another scientifically-minded modernization programme – known as ‘Druga Polska’ (Second Poland). This is the context in which the Workshops’ members enjoyed access to well-equipped television studios, for instance. Strange then, that their distinctly posthuman films and video artworks drew attention to human failure. See Konstantin Ivanov, ‘Science after Stalin: Forging a New Image of Soviet Science’ in Science in Context, vol. 15 no. 2(2002), 317-338. Leszek Kołakowski, ‘The Jester and the Priest’  in Towards a Marxist Humanism (London, 1970), 57. Cybernetics was introduced by American mathematician Norbert Wiener in his book Cybernetics, or Control and Communication in the Animal and the Machine (1948). The science of ‘control and communication in the animal and the machine’, it focused attention on the interactions of parts in a system, one which might including both machines and beings. ‘It is my thesis that the physical functioning of the living individual and the operation of some of the newer communication machines are precisely parallel in their analogous attempts to control entropy through feedback’ (Norbert Wiener, The Human Use of Human Beings: Cybernetics and Society (Boston: Houghton Mifflin Company, 1950) 26. Oskar Lange, Introduction to Economic Cybernetics (Warsaw: ‪Polish Scientific Publishers, 1970). Józef Kossecki, Cybernetyka kultury (Warsaw: PIW, 1974). Stanisław Lem, Summa Technologiae (Kraków: Wyd. Lit, 1964) 106. See A. Bogatowska and J Slownickowski, Atlas antropometryczny dorosłej ludności Polski dla postrzeb projektowania (Warsaw: IWP, 1974). Gastev cited in Richard Stites, Revolutionary Dreams: Utopian Vision and Experimental Life in the Russian Revolution (Oxford / New York: OUP) 152. René Fülöp-Miller, The Mind and Face of Bolshevism (London/New York: Putnam and Sons, 1927) 211. Unidentified critic in René Fülöp-Miller, The Mind and Face of Bolshevism (London/New York: Putnam and Sons, 1927) 212. Andrzej Pawłowski. ‘Cel i założenia Wydziału Form Przemysłowych’ (1965) in Inicjacje. O sztuce, projektowaniu i kształceniu projektantów Biblioteka wzornictwa 6’87 (Warsaw: IWP, 1987). http://www.galeriaopole.pl/pl/zbigniew-makarewicz-keep-level-trzymaj-poziom-trzecia-wystawa-sztuki?page=1 – accessed March 2014. ‘[What] I confronted myself with was like a paradoxon: to predict what could not be predicted. I am an anti-historicist, like Popper who thinks that history is as unforeseeable as the natural evolution of the species. On this, I agree with him’, Stanisław Lem, introduction to the German edition of Summa Technologiae, 1978 reproduced on-line http://www.fprengel.de/Lem/Summa/preface.html – accessed January 2010. Stanisław Lem, Summa Technologiae (Kraków: Wyd. Lit, 1964) 15. Stanisław Lem, Summa Technologiae, 1974 edition translated by Joanna Zylinska, (Minneapolis: University of Minnesota Press) 12. See David Crowley and Daniel Muzyczuk, Sounding the Body Electric: Experiments in Art and Music in Eastern Europe, 1957-1984 (Łódź: Muzeum Stuki, 2012). Bożena Kowalska, Polska avantgarda malarska 1945-1970 (Warsaw: 1975) p. 161. A. Kępińska, ‪Nowa sztuka: ‪sztuka polska w latach 1945-1978 (Warsaw: WAF 1981),65. W. Borowski, “Artony i Manilusy’, exhibition catalogue, BWA Lublin 1966, np. Principally, the repression of student protests in Poland and the invasion of Czechoslovakia by Warsaw Pact forces. Douglas Crimp, Rosalyn Deutsche and Ewa Lajer-Burcharth, ‘A conversation with Krzysztof Wodiczko’ in October 38 (autumn 1986) 33. Interview with Krzysztof Szlifirski by the author, Warsaw, 2010. Krzysztof Wodiczko, ‘Instrument – laboratorium perkusyjne’ in Res Facta, 5 (1971) 185. See Robert Ciupa, Monika Komaniecka, Szpiegowski arsenał bezpieki. Obserwacja, technika operacyjna, kontrola korespondencji jako środki pracy Służby Bezpieczeństwa PRL (Katowice-Kraków: IPN, 2011). See see Łukasz Ronduda, Polish Art of the 1970s (Jelenia Góra / Warsaw: Polski Western / CCA Ujazdowski Castle, 2009) 300-14. Kwiek in conversation with the author, summer 2013. Paweł Kwiek, Dokument obiektywny o człowieku [Objective Document About Man], 1976 unpublished mss, Centre for Contemporary Art., Ujzadowskie Castle,CSW Archive. Paweł Kwiek, ’Co robię’ in Ryszard Kluszczyński, ed., Warsztat Formy Filmowej (Warsaw: Centrum Sztuki Współczesnej Zamek Ujazdowski, 2000) 71. Rosalind Krauss, ‘The Post-medium Condition’ in Perpetual Inventory (Boston MA: MIT Press, 2010) 10. Sounding the Body Electric issued as CD! This is just a quick post to say that Sounding the Body Electric has been issued as a double-CD by Bółt Records. A copy can be ordered here. The CD includes some new material which was not in the show (but is discussed in the accompanying book) such as Rudolf Komorous’s minimalist ‘Tomb of Malevitch’, the first piece of electronic music composed in Czechoslovakia. it also includes Hugh Davies’ ‘Shozyg’ of 1964. In lieu of the full text, here is a link to a talk on Oskar Hansen’s ideas about the mobile body. It was presented at a conference at the Museum of Modern Art in Warsaw in June 2013.